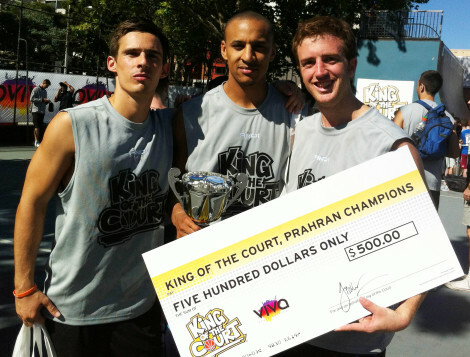 The Melbourne Streetball scene was set alight by Masunda, Smoke & Stef last Saturday when they held court to defeat all comers and win the $500 cash prize at the 2013 Melbourne 'King of the Court' 3 on 3 outdoor tournament. The 20 team field didn't know what hit them as the MUBC boys cruised through the knockout competition with comfortable wins at each stage. Stef (Pomasan) won the tournament MVP with a lights out shooting display in the final two rounds. Masunda also dominated in one on one play, scoring at will and proving to all why he is still the original 'King of the Court'. Combined with hard nosed defence and Smokes patented pick and roll / back cut playbook, the scoreboard ticked and ticked. The big turnout from Melbournes African-Australian community at the event provided some exciting highlights in the dunk comp. There were around 100 spectators in attendance for the final when the MU boys took on and took out the Longhorns. 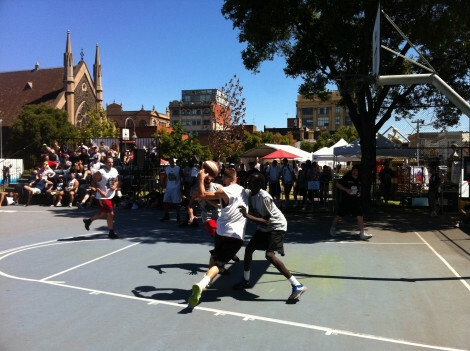 Big props to MSF Sports who put on the event at Prahran Park in combination with the Viva Youth Festival, And1 and the Stonnington council. © Melbourne University Basketball Club 2019. This page was last updated by smoke on March 4th, 2013.